The Centaurea genus of the daisy family includes several species such as annual cornflower and knapweed, Centaurea macrocephala is a species plant native to Armenia. They prefer full sun, but can bloom well in part shade. This is a tough perennial that tolerates nearly any soil condition except consistently wet, and is not at all fussy about pH. They are easy to grow, very tolerant of drought, and will naturalize. The blooms are large, very showy, long blooming, and quite unique. This unusual but rarely planted Centaurea is a great garden flower that will add stunning color to your garden. 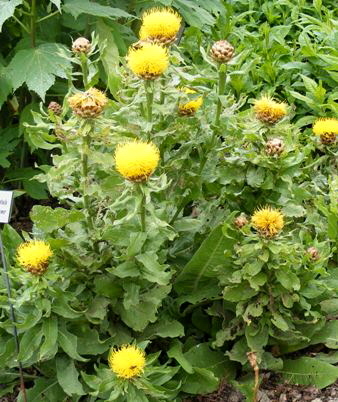 The flower stems are thick and stiff, bearing great globes of rich yellow thistle like blooms. The foliage is big and coarse medium matte green. Centaurea macrocephala is such a dramatic plant that you will need to work it into your design rather carefully, the strong and dramatic appearance can overwhelm fine, small plants. It would be a superb plant to incorporate in a rock bolder garden or mixed border. It is excellent for cut flowers or dried. An Aremenian flower, it does well in the midwestern plains. ‘Armenian Basketflower’ is virtually impossible to find in garden centers but fairly readily available from wild flower seed merchants. Once established the plant is tough and hardy, and prefers not to be moved or divided.